The slow reaction rate in the p-p chain and CNO cycle makes them in-practical for any application on Earth. The fusion reactions that seem most promising as terrestrial energy sources are listed in Figure 14-14a. These reactions occur at temperature about 100 times higher than that in the Sun's core. 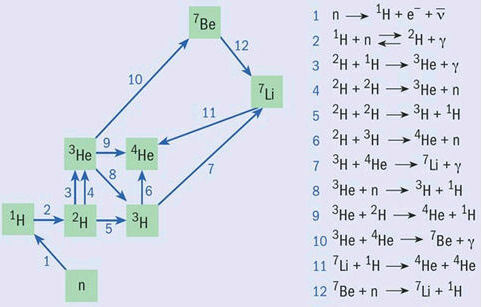 Reactions 5 and 6 are not thermo-nuclear reactions. They are used to produce the triton in reaction 1.
insensitive to what happened before the process. Its agreement with observation presents a fairly reliable verification for the theory of Big Bang. Thermo-nuclear Reactor - In order to release energy at a level of practical use for production of electricity, the gaseous deuterium-tritium fuel must be heated to about 100 million degrees Celsius. This temperature is more than six times hotter than the interior of the sun, which is estimated to be 15 million degrees Celsius. Scientists have already passed the task of achieving the necessary temperatures. In some cases, they have attained temperatures as high as 510 million degrees, more than 20 times the temperature at the center of the sun. The problem is how to confine the deuterium and tritium under such extreme conditions. A part of the solution to this problem lies in the fact that, at the high temperatures required, all the electrons of light atoms become separated from the nuclei. The fuel is in the plasma state. Because of the electric charges carried by electrons and ions, a plasma can, in principle be confined by a magnetic field. In the absence of a magnetic field, the charged particles in a plasma move in straight lines and random directions. Since nothing restricts their motion the charged particles can strike the walls of a containing vessel, thereby cooling the plasma and inhibiting fusion reactions (but would not damage the wall because of very low number density). 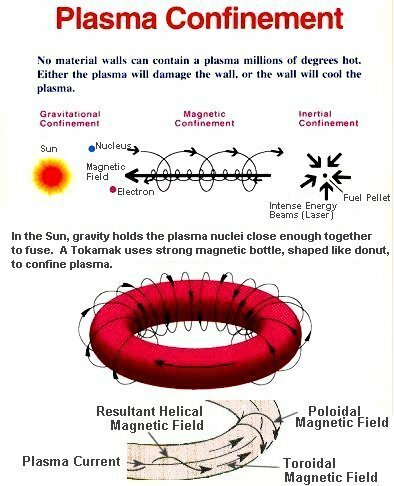 In a tokamak, the high-temperature plasma are confined by the magnetic field around the doughnut-shaped nuclear reactor. As shown by Figure 14-14c, the magnetic fields that confine the plasma are provided primarily by cylindrical magnetic field (toroidal magnetic field) and an internal plasma current (poloidal magnetic field). Combining the toroidal and poloidal magnetic fields creates a helical field that contains the plasma. However, long-lived pinched plasmas are extremely difficult to maintain. 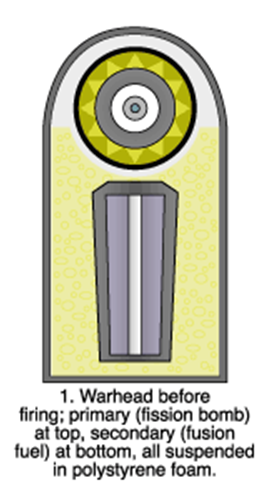 The plasma column is observed to break up rapidly. The reason for the disintegration of the column is the growth of instabilities. The column is unstable against various departures from cylindrical geometry. Small distortions are amplified rapidly and destroy the column in a very short time. 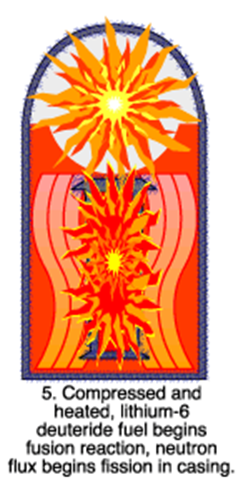 The mechanisms of instability in plasma physics are nearly unlimited. Some instabilities are comparable to examples borrowed from fluid mechanics, as the Rayleigh Taylor's instability, which consists of superposing two fluids with the heaviest on top. Imagine for example a vessel in which you pour water and then carefully add oil over the top. The system is then in a state of meta-stable equilibrium. The slightest nudge will provoke a change with the heavier fluid dropping to the bottom, which corresponds to a stable equilibrium. Another type of instability are kink instabilities, which occur when a current parallel to the magnetic field cause twisting of the field lines, recalling the effect obtained if we twist a rope too much: the rope twists out and kinks. The sausage or neck instability causes a greater inwards pressure at the neck of a constriction. This serves to enhance the existing distortion. The Tokamak Fusion Test Reactor has produced significant quantities of fusion power (up to 10 Million Watts) from the fusion of DT (Deuterium and Tritium). However, this has not yet reached the breakeven point when output power equals to the input. ITER fusion experiment that is to be built in France, and starts operation in 2016.
been selected in Cadarache, southern France. 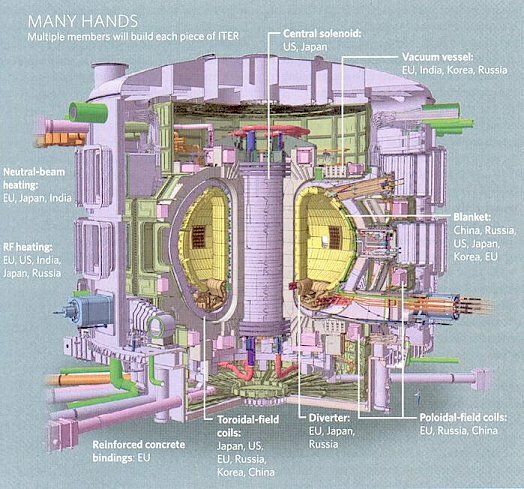 The US$5.5 billion funding from ITER's six international partners could be in place by the winter of 2005, allowing construction to begin in 2006, and operation in 2016. 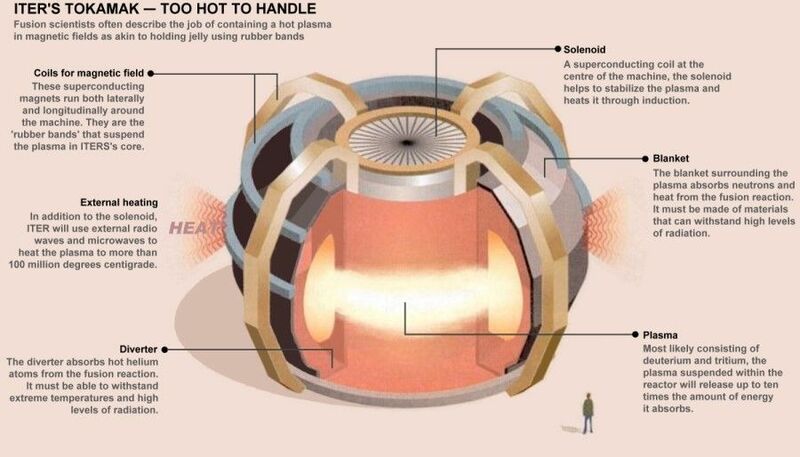 ITER is designed to heat hydrogen to hundreds of millions of degrees centigrade, and then squeeze energy from the resulting plasma, while holding it stable for minutes at a time. It is based on the tokamak model, which up until today has only one machine that has begun to approach the "break-even point". 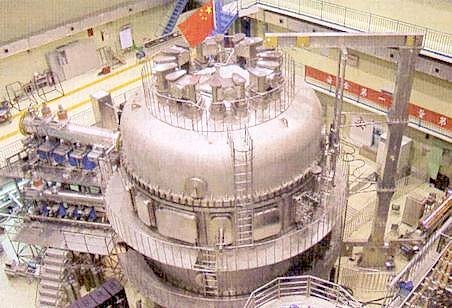 It is believed that by building a tokamak with bigger size, it will allow the high-temperature high-pressure plasma to remain stable longer (~ 7-10 minutes) producing 500 megawatts of energy within the interval. By 2009 the ITER project faced with ballooning costs and growing delays, its seven partners are likely to build only a skeletal version of the device at first. This mini-ITER should be able to run in 2018. The full-scale version would not come alive until the end of 2025. one?). Anyway, the research allocation for ignition will be reduced to 50% from 80%. The other 50% of the time will be used for experiments that mimic conditions inside nuclear weapons (to side step the moratorium on underground testing that began in 1992). Magnetized Target Reactor - The D-T fuel is injected into a spinning vortex of liquid lead, which will be crushed inward by a forest of pistons to start the fusion. One advanatage of this design is that the liquid lead does not degrade when it gets blasted by neutrons. 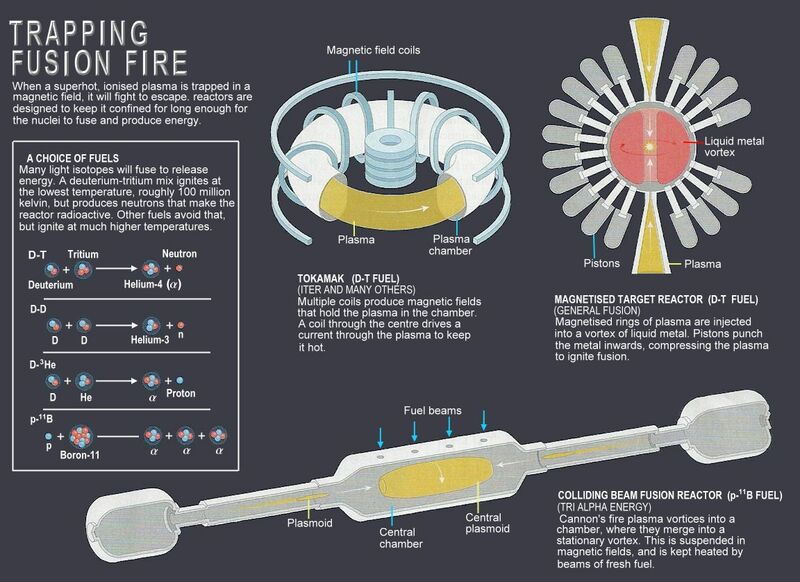 Colliding Beam Fusion Reactor - Two cannons at both ends fire plasmoids into a central chamber, where they would merge into a larger, free-floating one, which is in turn trapped by its own magnetic field. 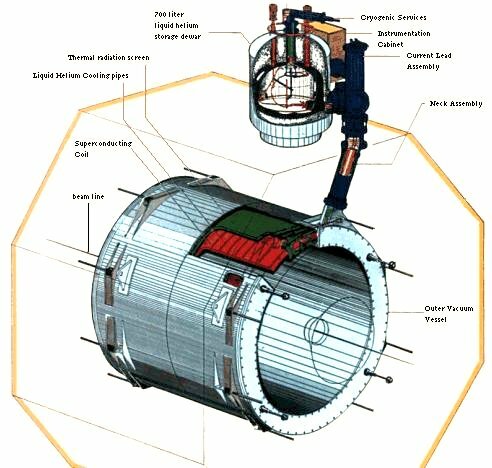 Fusion in the chamber will be sustained as long as the fuel supply is maintained (from the fuel beams). 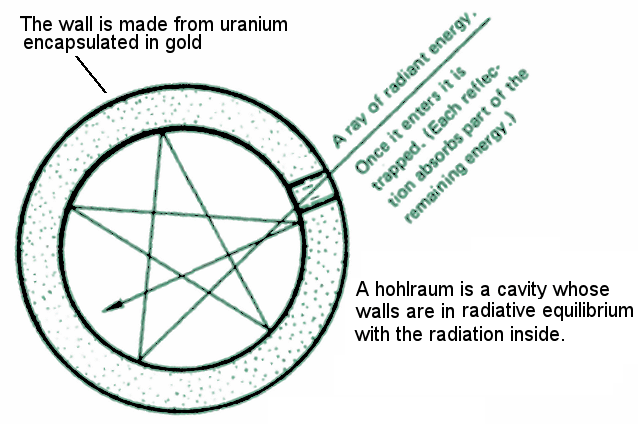 This method is relied on the Proton-Boron11 nuclear reaction which does not produce harmful substance. The end products of alpha particles are guided back thorugh the cannons by another magnetic field. A smaller version of the colliding beam design adopts the D-D reaction. It runs like a stroke engine - injecting fuel / extracting energy in each cycle. D + T He + n + 17.6 Mev (See Figure 14-14i). of the explosion -- thus one compound is used for both types of fuels ( D and T). 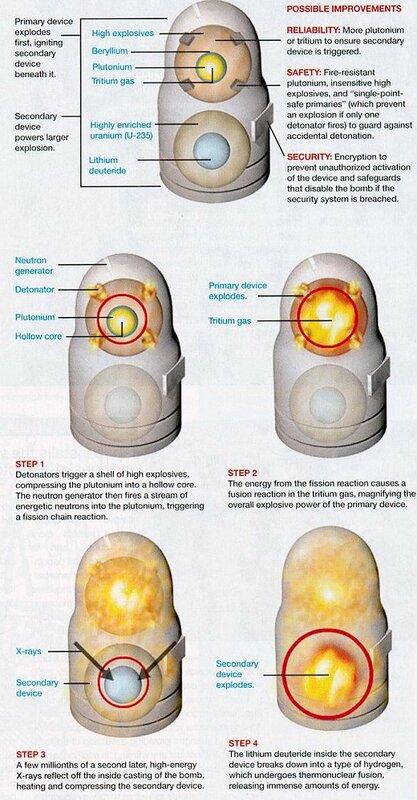 In a thermonuclear bomb, the explosive process begins with the detonation of what is called the primary stage. 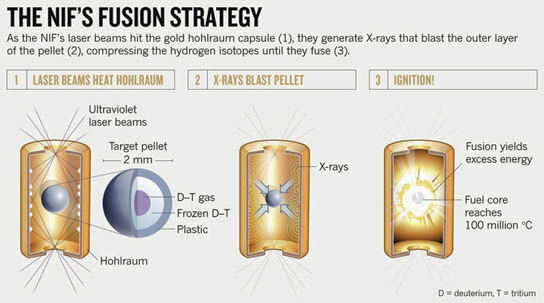 This consists of a relatively small quantity of conventional explosives, its detonation brings together enough fissionable uranium or plutonium to create a fission chain reaction (sometimes magnified with a smaller fusion reaction), which in turn produces another fission explosion inside the temper in the secondary device and raises the temperature to several million degrees. When the temperature of the mixture reaches 10,000,000 oK, fusion reactions take place. 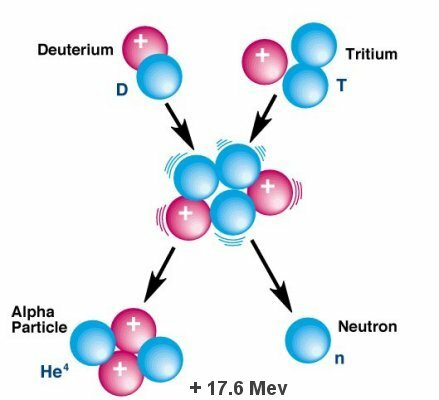 The neutrons from the fusion reactions induced fission in the uranium-238 pieces (highly enriched with U-235) from the tamper and shield, which produced even more radiation and heat and the bomb exploded (See Figure 14-14j). of the process perhaps in a small scale testing (to show that it's not a bluff). This is the ultimate meaning of deterrence. Table 14-05 below lists the various components of the Teller-Ulam H Bomb (see schematic diagram in Figure 14-14k) in sequence of the explosive events. and experiments. They are discovering things and seeing things that are not expected. The details are of course entirely classified. 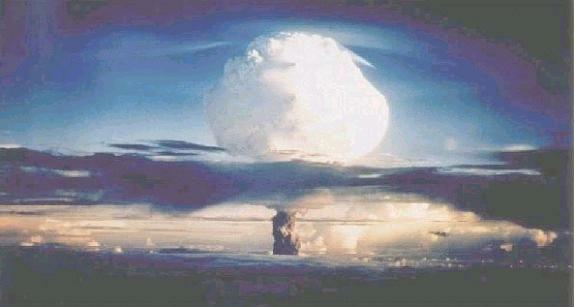 Because of the nuclear testing moratorium, researchers are trying to design new weapons without a test. It is known as RRW (Reliable Replacement Warhead). New design includes improving the plutonium pit, replacing the toxic materials with other heavier material (for the tamper to amplify the initial explosion), and substituting the volatile explosives (on the outer shell) with an insensitive type (Figures 14-14g). Such ideas have to pass the review of the generals, who have to change the software and hardware systems for delivering the bomb. RRW designers try to reassure the critics that the new warheads will be compatible with existing systems. Figure 14-14k shows the differences in the design of the old and new types. 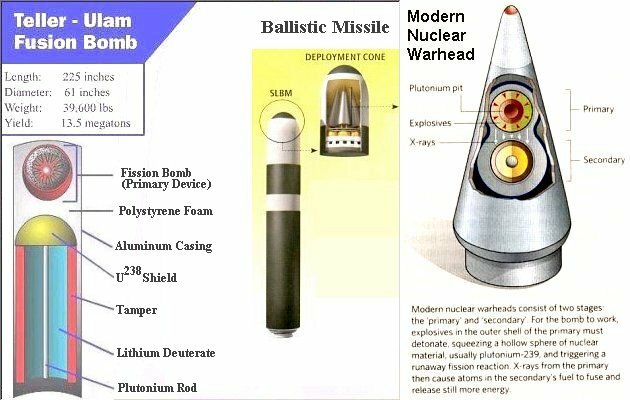 A 2007 study shows that existing warheads will last for at least another 50 years making the new bomb seemingly less necessary. The US House of Representatives will vote on a bill that would eliminate funding for the RRW from the 2008 budget. But the RRW is not done yet. Other plans are working its way through Congress and the Senate.